This spikey Stegosaurus looks fierce, but don't worry -- he's a vegetarian! Learn all about this massive dinosaur with a fun fact sheet. What do you like most about the Stegosaurus? 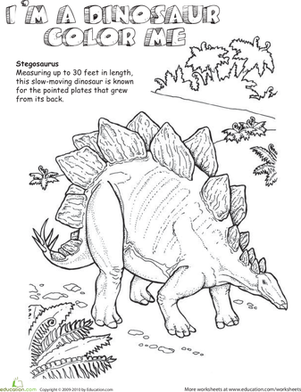 Your child will love coloring in this magnificent dinosaur, the stegosaurus! Here's a happy stegosaurus straight from the Jurassic period. This coloring page is great for any dinosaur loving kid! Have your child colour in this picture of a cute cartoon stegosaurus taking a stroll through the prehistoric world. Young readers will love digging into this passage's cool shrimp facts, and they'll get a nice reading comprehension workout in the process.